Medical office furniture that poorly supports the bodies of your employees and patients can cause repetitive movement injuries and backaches. An ergonomically designed office can alleviate these job-related injuries. “Your staff’s overall health will be better and they’ll be a lot happier working there,” says Mollie Everett, senior healthcare program manager of Herman Miller Healthcare, a Zeeland, MI-based firm which designs furniture and systems for offices. Task-intensive work, such as work performed by a receptionist or someone who is managing medical records, requires a good chair that can be adjusted to support anyone. Some measurable symptoms of poor ergonomic design in your workstations include back problems and carpal tunnel issues as a result of a poorly adjusted height at a workstation, as well as headaches if computer screens are too far away or too close to your staff. Cynthia Roth, CEO of Ergonomic Technologies Corporation, a Syosset, NY-firm which provides ergonomics consulting services, also suggests installing non-glare producing lighting; monitors that have no glare and are easily read by all staff; and non-slip floors. “Office workstations layouts should have the most frequently used items closest to person to eliminate reaching,” she adds. Since your patients come in all sizes, there are ergonomic considerations for your waiting area. People who are not physically fit, have difficulty moving, are older, or have been ill often use the arms of the chair to push themselves up. 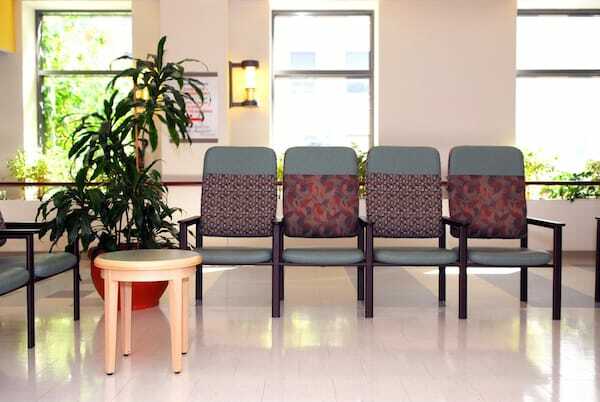 The seating in the waiting room should also support bariatric seating. Today, this type of seating is well-designed and blends in with the rest of the furniture. “There’s nothing that shouts out that this is a large person’s chair,” says Everett. Even the exam room can be designed to be more ergonomic. For example, there might be an issue where supplies are stored in an inconvenient location, either too high in a cabinet or too low off the ground. Everett suggests observing your employees perform their normal duties to see what needs to be change. For the physician, Roth says an exam room should have adjustable seating for physicians of varying seated heights as well as adjustable exam table for physicians of varying heights and reaches. When doctors are experiencing neck, shoulder, back and lower body discomfort, such as in the leg, Roth recommends paying attention to the need for an office audit by an experience Certified Professional Ergonomist. “The ergonomist will evaluate and make recommend changes to the office layout, recommend changes in equipment or furniture and watch the physician work throughout the day and make recommendations for postural changes that might be necessary,” she says. Roth adds that if many administrative errors are being made, it might be time to assess the back offices to see how the personnel are functioning with the equipment, computers, and office chairs. “Recommendations and changes will be made onsite to alleviate any ergonomic risk factors identified,” she says. Everett’s company can produce a modular work station for medical offices. While it sounds expensive, the costs are the same when compared to a built-in station which contains no adjustments. No matter the costs, Roth says an office designed with ergonomics allows you to be more efficient, more productive, and have less error potential.